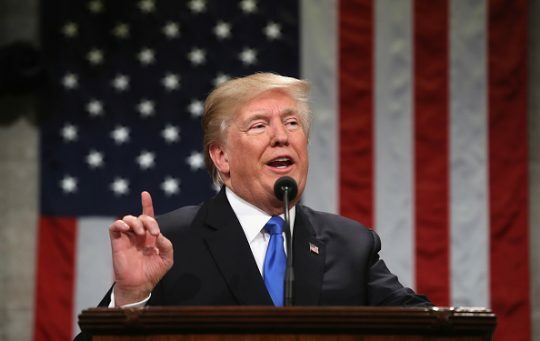 The response to President Donald Trump's first formal State of the Union address on Tuesday was divided heavily along party lines, with liberal activists, Democratic politicians, and left-leaning organizations describing the speech as "divisive," an exercise in "showmanship," and blatant "propaganda." Former Virginia governor and potential 2020 Democratic presidential candidate Terry McAuliffe was one of the most vocal critics of the address. McAuliffe, who attended the speech as a guest of House Minority Leader Nancy Pelosi (D., Calif.), told MSNBC host Chris Matthews that he witnessed a young Dreamer, an illegal immigrant brought to the U.S. as a child, break down in tears when Trump addressed immigration reform. "She had tears in her eyes listening to the president of the United States," McAuliffe said. "This is embarrassing." McAuliffe also castigated the speech as nothing more than "a continuation of a presidency defined by bigotry" and "partisanship" on Twitter. "This was not the speech of the unifying leader our nation needs, it was a continuation of a presidency defined by bigotry, partisanship and attacks on the foundations of the open and welcoming American society that has led the world in innovation, democracy and progress. #SOTU," McAuliffe tweeted. Elected Democrats across the country, including members of Congress and governors, echoed similar sentiments. The President's #SOTU address last night was total propaganda and bluster – so I went to the White House website and marked up his speech using @Genius. The President paid lip service to bringing the country together tonight, but continued to push the GOP’s extremist vision of America. Many Democrats took particular umbrage at what they saw as Trump's attempt to take credit for the African-American unemployment rate hitting a record low. Several media figures responded similarly to Trump's speech. MSNBC host Joy Reid claimed that the president was trying "to call on the tropes of 1950s-era nationalism" by discussing "church, family, military, police," and "the national anthem." CNN commentator Sally Kohn said on Twitter that when members of the audience began chanting "USA" in response to Trump's "nationalistic hate mongering," it "sent chills down" her "spine." I am a patriot and I love my country but the way people have been chanting "USA" lately, especially in response to nationalist hate mongering, sends chills down my spine. This entry was posted in Politics and tagged CNN, Democratic Party, Democrats, Donald Trump, MSNBC, State of the Union, Terry McAuliffe. Bookmark the permalink.